the HAES® files: Ending Diet Culture One Babe At A Time! I travel around the country lecturing at universities about the harmful effects of diet culture and fat shaming. We live in a culture in which most children would rather lose an arm than be fat. We live in a culture in which people live out their entire lives waiting to lose enough weight to wear a bathing suit or dance in public. We live in a culture where calorie-counting and body dissatisfaction are normal parts of our daily lives. These things make us unable to pursue our deepest desires, they force us to belittle ourselves and question our worth, and they set up an invisible set of barriers that limit our lives. Lose Hate Not Weight is the philosophy that guides my life and my work. LHNW seeks to de-center self-hatred, aka the “I am never good enough” mindset, a learned ideology that is a false and powerful motivator in people’s lives, and re-center self-care and self-love, touchstones of our native relationship to our body. Until about five months ago, I had only ever spoken about LHNW in lecture halls for 60 to 90 minutes at a time. 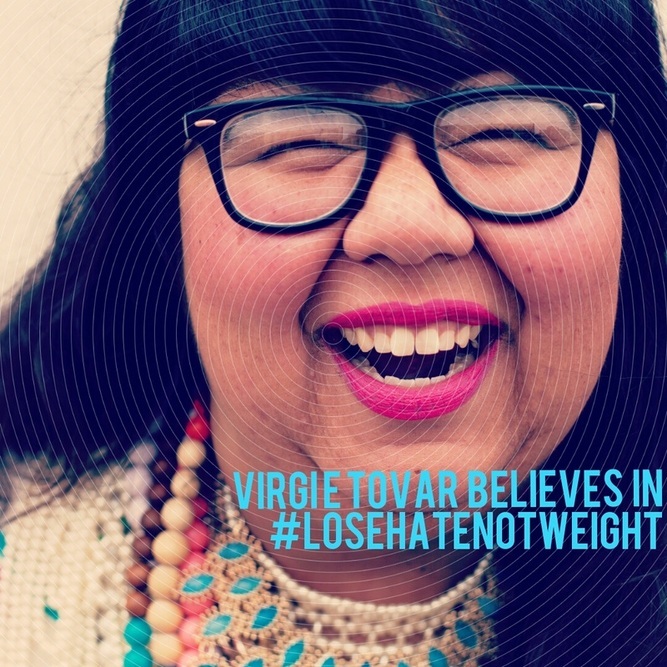 My name is Virgie Tovar. I’m a 250 pound woman who decided to stop dieting because I wanted to stop waiting & start living. I travel the world, eat cake, wear two-piece bathing suits, date, laugh, live, and I feel fabulous RIGHT NOW. I want to prove to you that you are more than a number on a scale. Something I realized quite some time ago was that we live in a weird culture with a skewed perspective. What’s so odd to me about the culture I live in is that just doing simple things – like laughing with abandon or wearing a short skirt – is totally revolutionary when you’re doing it in a fat body. And the more closely I worked with women around body image, the more I realized that this issue of shame and self-hatred was not limited to women with big bodies. Everyone wants to feel body autonomy, but they often have no idea how or where to begin. This question doesn’t just require an answer; it requires a change of perspective. And that takes time. My most formative, personal, and political experiences have happened over weeks of critically analyzing what I’d been taught, writing about it, getting angry, feeling validated in that anger, mourning old ideals that no longer had a place in my life, and receiving the support and encouragement I needed to complete this very exciting, very scary process. Babecamp was inspired in many ways by the structure of and ideology behind my very first truly transformative educational experience – my introduction to feminism. I was an undergraduate at UC Berkeley, 20 years old, ambivalent about my Pentecostal upbringing, ashamed of my sexuality, and still trying to find the solution to my “weight problem.” I enrolled in a class called Female Sexuality because of the promise that we would talk about orgasms (something I was still pretty ashamed of having). In this class I was given the opportunity to re-evaluate the things I had been taught about my body. I was given a new vocabulary to develop and articulate thoughts that had previously only been vague feelings. I was encouraged to express anger when I felt it as well as joy, and this helped me develop confidence. Feminism saved my life. And, more pointedly, the women who were there with me – who truly saw me and understood what I had been through – saved my life. Together we took a great risk, a total leap of faith. Instead of betting against ourselves, we bet on ourselves. This is not what the culture teaches women to do. I know that this experience I had was a great privilege, and I wanted to help democratize it by taking it out of the university setting and into the most democratic space I have access to: the web. Ultimately, forty-two people enrolled from all over the world. I had Babecampers in Australia, New Zealand, Mexico, and all over the U.S. I had students who were in their early twenties and some in their fifties. Many of the most enthusiastic participants held one or more marginalized identities. And I am excited that I was ultimately able to offer partial scholarships to about 25% of those who enrolled. On the final day, I held a virtual open mic: where Babes were encouraged to share something they’d written during the course of Babecamp in a private teleconference call. Those who just wanted to listen in were also welcome. Those who spoke, shared some of the most personal parts of their lives while we all listened. This was my favorite part of the entire month we spent together. This experience had transformed them. They, in turn, had transformed me. It felt the same as these kinds of really special moments always feel: like something inside of you has changed and with that, so has something greater.